Let your spouse know that you are there for her. 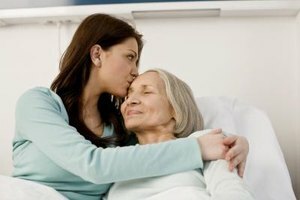 If your spouse has a family member who is diagnosed with a terminal illness, she may begin grieving the loss of her family member before the physical loss actually occurs. You can help your spouse deal with her grief and stress by offering her emotional as well as practical support. One of the most important ways you can help your spouse through this difficult time is to listen to him when he wants to talk about his ill family member and/or about what he's feeling. Give him your undivided attention. For example, turn your phone off, set the newspaper aside and turn off the television. Focus solely on your spouse. Don't think about work or what you're going to have for dinner. He may want to share good memories, voice his frustrations, or talk about his worries and fears. It's better that your spouse discuss his fears and emotions as they arise, rather than ignore them, according to the HelpGuide.org article, "When a Loved One is Terminally Ill." Listen without interrupting or giving advice, unless he requests it. However, if he doesn't feel like talking, don't try to force him to talk. Be conscientious of your spouse's feelings. Her emotions may be all over the place. Keep in mind that's she's likely starting the grieving process before her family member even passes. She may feel guilt, regret, anger, hurt, fear and more. Don't tell her that you know how she feels or what she's going through. Saying that you understand what someone is feeling minimizes that person’s experience and takes the focus away from her, according to Canadian Virtual Hospice website. Instead, tell your spouse that while you can't understand how she must feel, you are there for her. Be patient and sensitive to the grieving process as it can take a long time. When someone is grieving, he is less likely to recognize his own personal needs, says Melissa Wright, a therapist and author of "Grief: Helping Loved Ones" on the website, GoodTherapy.org. He might not eat properly and skimp on his sleep. His stress level may be extremely high. Encourage him to eat healthy and regularly, to get enough sleep and exercise to release stress. If he doesn't maintain his health, he won't be much help to his terminally ill family member. Offer your spouse practical support to help make her life more manageable. She may be taking care of her terminally ill family member, grieving the inevitable loss, and helping her family member take care of important issues. She may need to make end-of-life care decisions and funeral plans. There may also be legal and financial issues that your spouse needs to oversee. Take some of the pressure off your spouse by doing the grocery shopping, making meals or cleaning the house. If your spouse is the caregiver, offer to sit with her family member while she catches up on sleep or eats a decent meal. Assist her by taking her family member to doctor appointments or offer to pick up medication from the pharmacy.